Info Morris E. "Morrie" Muhleman (1915-1998) was a political activist within Rock Island County, Illinois, United States, for most of his life. Born June 1, 1915 he was raised in the City of Rock Island where he attended school and graduated from Rock Island High School in 1933. He married Winifred McClean on October 7, 1936. Prior to his election to public office Mr. Muhleman served as a bookkeeper, salesman, was manager and co-owner of a farm implement store. Morrie Muhleman was an active member of the local Republican Party for years and in 1950 Muhleman was elected Sheriff of Rock Island County. He served in that office until November 1954 when he was elected to the Illinois State Senate. In the State Senate he was Vice-Chairman of the Senate Highways and Traffic Regulations Committee and also served on the Industrial Affairs Committee, Municipalities Committee, Pensions and Personnel Committee, and the Revenue Committee. Muhleman was defeated in a surprise upset in 1958 by political veteran and former State Treasurer, Ora Smith. In late 1960 Muhleman declared his candidacy for Mayor of Rock Island, Illinois. He won the February Primary and went on to victory in a tight Mayoral election the following April. Muhleman served as Mayor for one term before retiring in 1965. Muhleman's term as Mayor was marked by great cooperation between the city, business, and and civic interest. Under his leadership they became a team working together to make Rock Island a better place to live. He had great relationships with the city council and city manager, due to that relationship he was able to help Rock Island move forward in prosperity and development. His mayoralship remains a model of efficiency which his successors have strived to emulate. He remained semi active in the community as a member of the Masonic Order, the Methodist Church, Kiwanis Club, Chamber of Commerce director, Boy Scout Council. Past Fair Association President, and the Executive Board of Illinois Sheriff's Association as well as manager of the Centennial Bridge from 1965 to 1980. As in every position he held he served honorably and without question as to his integrity. He was the owner of an Insurance Company in Rock Island known as M. E. Muhleman Agency. Morrie Muhleman served the City of Rock Island, his County, and his State with honor and respect always doing his best to serve the people he loved. 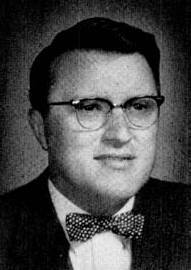 Mayor Morris E. Muhleman died November 11, 1998 at the age of 83.